These feel good little jars offer a special message in the bottle: "This guardian angel watches over you each day, with warm and loving care, this little angel guides your steps and goes with you everywhere!'" 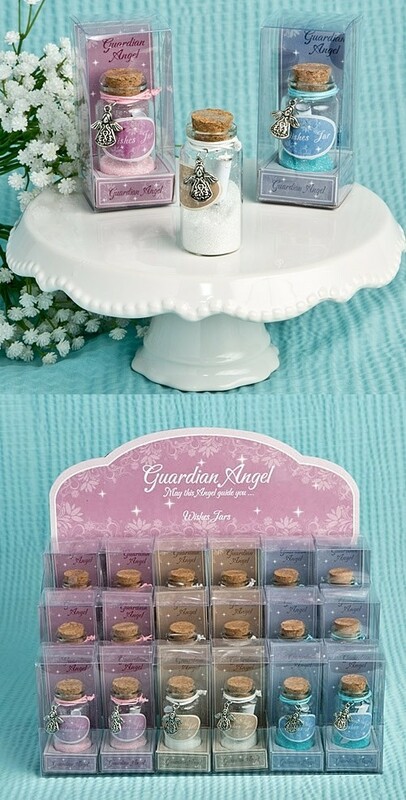 These miniature wishing jars come in three (3) assorted colors: a pretty pink, a pure white and a bright blue. Each jar is cork-topped with a metal angel dangling from a matching colored ribbon, and comes packaged in an acetate box on a platform with a colored background. Each set of 18 jars comes in a display stand that includes six (6) of each color. PLEASE NOTE: Sold as sets of 18 and prices quoted below are per set.